While it’s a great idea to have some money around your house in case of emergencies, some places are better to stash that cash than others. Let’s take a look at some great spots for hiding money as well as some not so great places. Okay, this is an obvious one, but it’s still a good thing to have around the house. It’s important to make sure it’s either hidden or bolted down so it can’t be wheeled away. This is also a great place to store items like passports and birth certificates, so you’ll always know right where they are. However, if you need to get out of the house quickly, this may be more difficult to access. The chances of anyone breaking into your home and bringing along a ladder or crawling on the floor are not great, especially when time is of the essence. 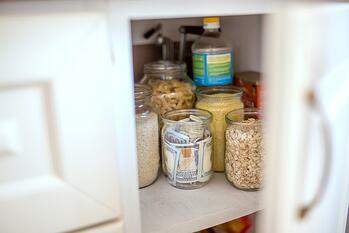 Try hiding money in places that are little more difficult to access than just at eye level. This could include on top of shelves, under rugs or floorboards, or inside vents. Roll up bills and place them inside of everyday objects such as a flashlight or a pen. This is an item that would be easy to grab on the way out the door but isn’t as obvious to potential home intruders looking for valuables. It’s a smart idea to provide layers of defense when it comes to hiding anything. For example, if you have large shelves of DVDs, you could place the money within the insert, clip it in the case, and then place it on the shelf. So not only would someone need to figure out money is hidden in the DVDs, they would need to figure out which one. With so many jokes and clichés about hiding money in or under your mattress, if someone were to break into your home, this is one of the first places they’ll check. Again, this is such a common hiding spot that a potential burglar would check there. Just expect anyone who breaks into your home to ransack the fridge and cupboards. While this used to be a smart hiding place, it’s become so commonplace it’s bound to be checked regardless of what you are hiding there. Most importantly, wherever you choose to hide this reserve cash should be somewhere you’ll remember. You want to pick a place where it’s well hidden, but not so well hidden that you aren’t able to find it.